The first station known as Bank was founded in 1900, on the 25th of February. That was also the moment when the South London and City Railway was expanded between Borough and Moorgate. King William Street, the former line terminus was closed in 1900. An interesting fact about the station is that the lift entrance and the ticket hall are constructed in a church’s crypt. Throughout the years, Bank Station has gone through notable events. For example, in 1941, when the famous Blitz took place, the ticket hall for the Central line was hit by a German bomb. Because of this incident, there were 69 persons injured and 57 killed. A crater remained after the bombing and it measured 30 x 37 m and for two months the station was out of use. Later, the crater was hidden by the Bailey Bridge that took over the traffic. Another significant event happened in 2003, when the station was part of Exercise Osiris, a special disaster training exercise. It was considered one of the most realistic disaster exercises in the world and it implied the preparation of the people for a mass decontamination in case a nuclear, chemical, radiological or biological attack would take place. It involved no less than 500 persons working for services like London Underground, Ambulance, fire brigade and police and it lasted several hours. In order to get rail transport from London Luton Airport to Bank Station, you can take the bus to Luton Airport Parkway, the train to King’s Cross St Pancras and the Tube to Cannon Street. From there, you can walk to Bank Station. 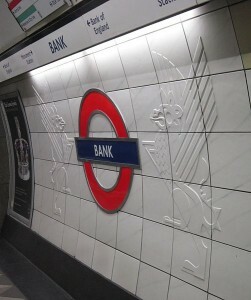 Another option is taking a taxi transfer from Luton Airport to Bank Station. So as to travel by car from Luton Airport to Bank Station, you have to take the M1 motorway. Luton Airport is 34.3 miles away from Bank Station. A Luton Taxi to Bank Station with 247 Luton Airport Transfer will last 1 hour and 20 minutes. The price starts from £57 for a saloon car.